Ever wonder what some of the non-anagram sayings on the graveyard tombstones say? Some are just old sayings like Memento Mori (Remember Death), but then there is also My Glass Is Run. The message is simple enough but where did it come from? The line comes from a poem called Tichborne's Elegy. It was written by Chidiock Tichborne shortly before his death for practicing Catholicism in a time when doing which in England was a punishable offence. I want to give GREAT THANKS this week to Dan Olson for doing the research of this topic, pretty much all of the hard work. And he even spelled my name right! Thx for the hat tip. 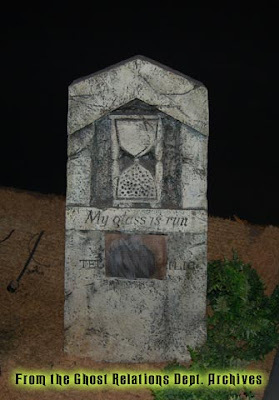 A couple of footnotes: "My Glass is Run" was a cliché on tombstones, it's just that this cliché has a specific literary source. Also, the "glass" is an hourglass, not a glass of wine or other drink. "My time is up," in other words. "Stop reading and get in your doombuggy!"